The power of Nature (for good and bad) runs headlong into The Evil That Men Do in Southern Dog, a new full-color 4-issue comic miniseries from Jeremy Holt (writing) and Alex Diotto (art). 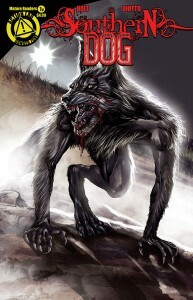 “When awkward high school teen Jasper Dixon conceals an injury sustained during a hunting excursion with his family, his infected wolf bite combined with the hormonal changes of puberty triggers a disturbing physical transformation. Now he’s forced to confront his Deep South upbringing and monsters far worse than what he’s become!” It’s out now from Action Lab, and you can get a preview over at Comic Book Resources.